Recently I have been writing much about preserving and respecting heritage (Valuing the Past…and also Is the Past past saving in The Heritage Journal) but I recognise, too, that nothing stays the same – at least not in the physical world. The Iron Man is a case in point. The first man standing was a carved ship’s figurehead placed there in 1911 by Cardiff entrepreneur, Solomon Andrews. 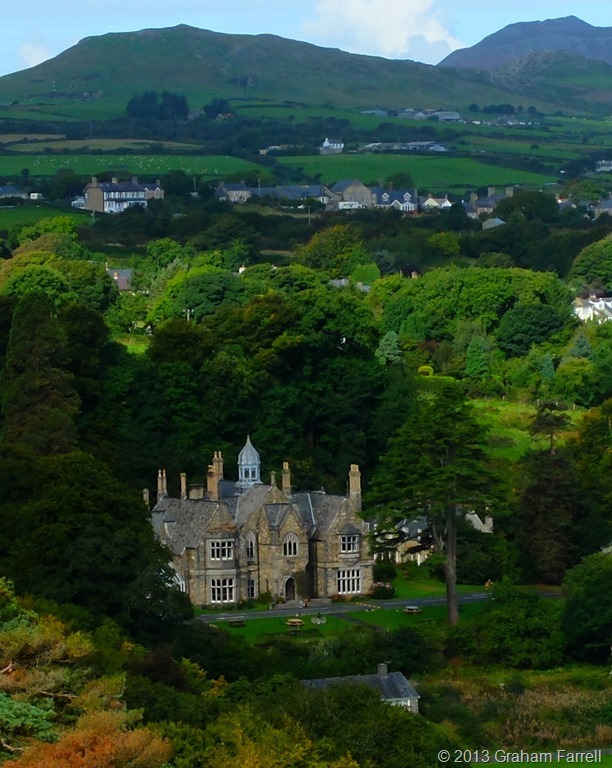 Andrews had bought the nearby grand house of Plas Glyn-y-Weddw some twenty years earlier and turned it into a public art gallery, the first of its kind in Wales. Today the house is the home of the wonderful Oriel Gallery, run by a trust, and the place where Welsh creativity is celebrated. The ship’s figurehead did not fare so well. In 1980, after it had been set on fire by vandals, local artist, Simon Van de Put replaced it with a figure of an ancient warrior made from recycled sheet steel. As had been envisaged, the warrior , exposed to the sea winds, weathered away until only his boots remained. But in 2002 reinforcements arrived, delivered to the headland by a helicopter and winch. Today this new Iron Man surveys Cardigan Bay with the kind of stance that says he means to stay. In fact I’m not altogether certain that he might not also be a woman. This warrior, then, is the work of local craftsmen Berwyn Jones and Huw Jones. To me the rope-like ironwork suggests sinew and muscle. It is thus simultaneously symbolic of both decay and regeneration; a rare act to pull off. The tilt of the head is dignified, but wistful too. I would like to feel I have the courage to stand up behind this guardian. I am not Welsh of course. As far as I can tell my ancestors were Anglo Saxons and Normans. But if we do not celebrate the best of our culture, our own and other peoples’, then think how much is lost – all those things that make us truly well nourished humans – the poem, the saga, the dance, the metaphor, the hymn, the riddle, the rune, the touching words, the art – all that makes us recollect and care, confers insight and wisdom, gives us heart and good heartedness. 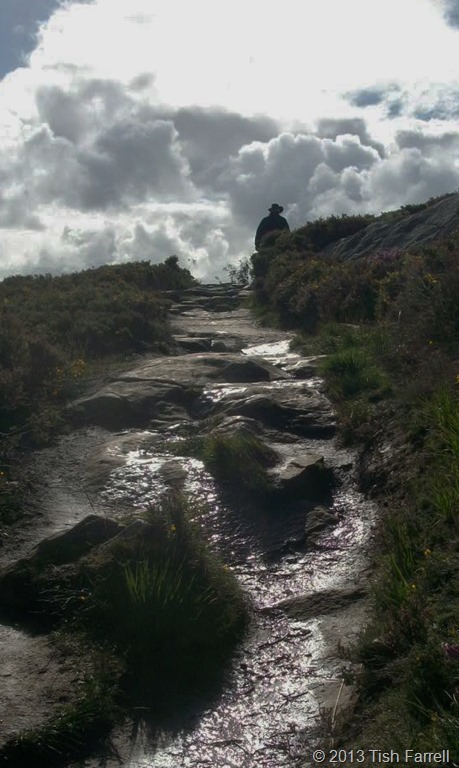 For now though I take joy in the knowledge that when the wind blows across Mynydd Tir y Cwmwd (The Headland), even though I am not there to hear it, the iron warrior sings. 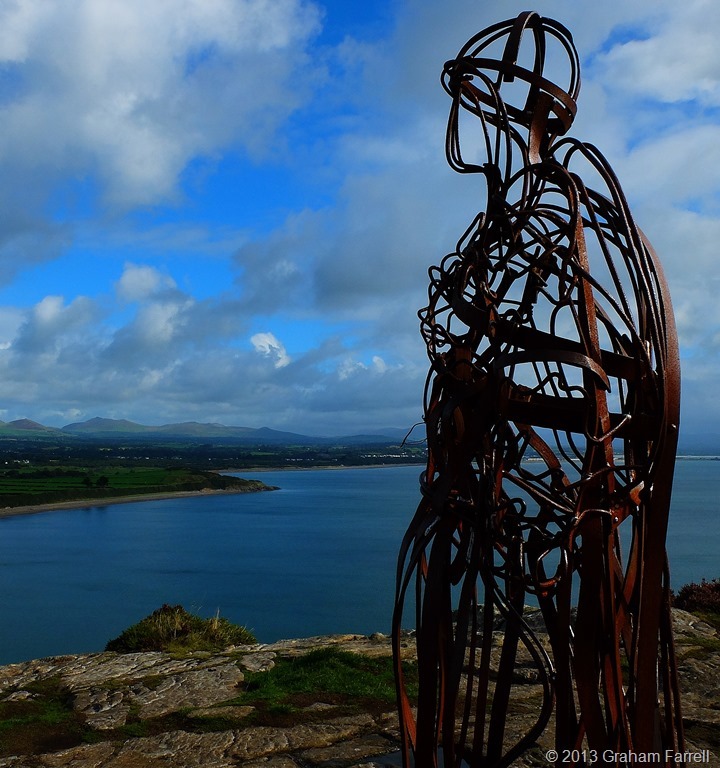 Posted on December 3, 2013 September 19, 2016 by Tish Farrell	This entry was posted in art, Heritage, photography, Wales and tagged #amwriting, Berwyn Jones, Cymru, Huw Jones, Iron Man of Llanbedrog, Llyn Coastal Path, Oriel Plas Glyn-y-Weddw, Simon Van de Put, Solomon Andrews, Tish Farrell, Wales. Bookmark the permalink. ← Valuing the past: how much for Old Oswestry Hill Fort? What a wonderful post. The photography is beautiful and your words are poetic and sincere. I hurt and become very angry whenever I become aware of attempts to eradicate a culture. You are a powerful writer and I enjoy reading your work. What very kind words, Pat. I’m glad you liked the warrior. Thanks, Frizz. Glad to amuse. The Iron Man (or Woman) looks wonderful, do you have more pictures? I think that was the best one taken, but will have a look through our pix. “the words formed from the rush of sea on rocks, the wind whistling down from the heights of Yr Wyddfa* ” Such beautiful words Tish. Beautiful and evocative post. Thank you. I, too, loved that description: “the words formed from the rush of sea on rocks”, even though I have no clue how to pronounce words that have no vowels…. Ah-ha! That’s because the vowels are hiding in ‘ys’ and ‘ws’. I loved Wales. I loved England. And Ireland. And I most especially loved Glastonbury Tor. But it is all magic. Great post Tish. 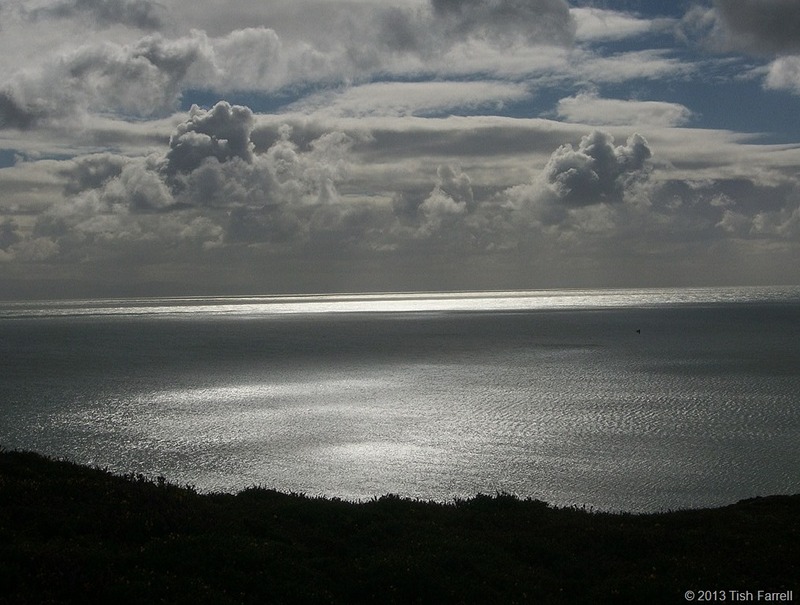 I loved what I saw of Wales on my trip to St. David’s on the west coast. It left me longing to see Snowdon and the north. And I love the present Iron Warrior – “simultaneously symbolic of both decay and regeneration” – and I’ll bet the wind does sing as it passes through and around. Thanks Lynne, and yes, North Wales is very beautiful, but then St David’s is a lovely spot too. It has a great little art gallery there with items from the national art collection, if I remember rightly. Love the sculpture, and enjoyed learning a bit about the efforts made to preserve the Welsh culture. It’s so important to give space to our grandparents and forefathers, and not to throw out all that’s old in order to make way for the new. Absolutely, Shimon. With our sights ever on changing technology, it’s easy to start thinking that the sum of our knowledge is all there is. I think, too, that living with our minds mostly in the material world, can dull the subtlety of thinking and metaphor that was/is a distinctive characteristic of non-literate societies. Literacy is a great blessing, but sometimes we lose something too – the bard, the griot, the history singer, the teller of epic tales, the metaphors that deepen understanding.